Lower rhytidectomy, popularly known as neck lift, is a cosmetic surgery procedure to create a more sculpted, youthful neck by providing a subtle lift to the sagging neck skin. At the time of pre-op consultation, the surgeon will explain the pros and cons of the neck lift procedure, and may also present neck lift before and after photographs. The first goal of a responsible surgeon will be to educate the patient and help them make a well-considered and realistic decision. 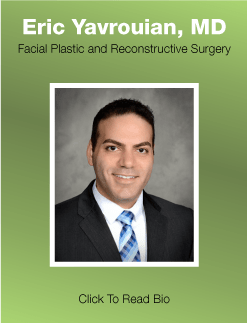 Facial plastic and reconstructive surgeon Dr. Eric Yavrouian provides neck lift to patients in Glendale, Pasadena, Burbank, Greater Los Angeles, Beverly Hills, CA, and other cities and neighborhoods across the region. What are Neck Lift Before and After Images? Before and after images in case of neck lift cosmetic surgery refer to a set of pictures belonging to a previous patient who has undergone the same surgery with successful results. The set includes images taken prior to the surgery and after the surgery at a stage when the post-op swelling and bruising has been completely resolved and full effects of neck lift are visible. The surgeon will take care to ensure that the pictures are obtained with the patient’s complete consent and presented before new patients in a discreet manner. The patient’s identity may be kept confidential as per the standard protocol. The surgeon’s only purpose behind this exercise is to use the before and after photos to describe the potential effectiveness of neck lift surgery to new patients. When a new patient is considering neck lift surgery, they may only have a limited understanding of how the procedure can improve their neck and lower face profile, and whether it will meet their personal cosmetic goals. Some patients may require neck lift in conjunction with neck liposuction. Neck lift is also often performed together with facelift surgery for more harmonious results. Therefore, the surgeon will discuss all treatment options with the patient and make the most appropriate recommendations. If the patient has access to neck lift before and after photos, they will be in a better position to make the right choices. Most satisfying outcomes in any cosmetic procedure are usually achieved when the patient has clear aesthetic priorities, a positive mindset and reasonable expectations. Therefore, experienced surgeons prefer to show neck lift before and after photos at the very first appointment so that the patient can clearly understand what the procedure can or cannot do for them. This mitigates the risk of any disappointment occurring for the patient at a later stage when it may be difficult to reverse the procedure. Fabulous and focused facial plastic and reconstructive surgeon Dr. Yavrouian receives patients from Glendale, Pasadena, Burbank, Greater Los Angeles, Beverly Hills, CA, and nearby areas for neck lift surgery. The surgeon has an option to present neck lift before and after photos on their practice website for free access to everyone. New patients can simply review the photos online and then decide if they want to seek a personal neck lift appointment with the surgeon. What has changed this game is digital technology since this technology has enable people to see pictures online in ways they have never been able to before. Now the plastic surgery community is not the only community to take in digital technology since this new innovation is amazing. Now with website pictures someone can determine if neck lift surgery will work on them from the comfort of their own home, car, work, coffee shop, and so on. On top of this, these pictures are so clear you can almost predict the future. They say a picture speaks a thousand words, well a digital picture doubles that many words. Now someone can make this poignant decision and know they are making the right call. If they do want to proceed, they are less anxious since they know how this surgery is going to look on them because they were able to see how it looked on other people.